Why Does Cheese Need to be Aged Anyway? This is a very important question that I often get when talking to people about cheese. Aging cheese can be a very confusing subject. Why is some cheese, like Parmesan, best after years and years of aging, while other cheese, like Chevre, is best eaten fresh? 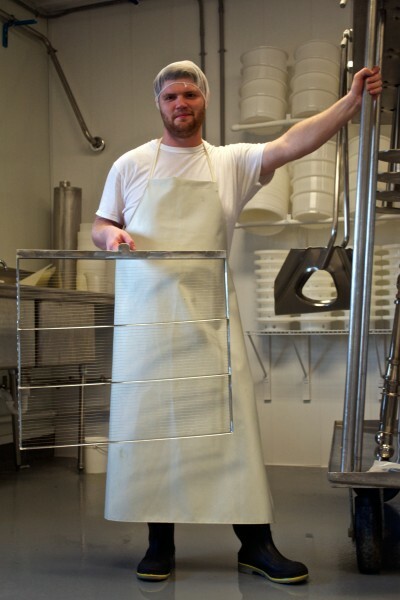 In the end, it all comes down to the chemistry and microbiology of cheese making. So, ladies and gents, sit back, get a drink, and prepare yourselves for a delicious food science lesson. Afterwards, I recommend grabbing some cheeses of various ages and verifying the following information with your own taste buds. All cheese is made up four ingredients: milk, culture, rennet, and salt. Milk is the main raw ingredient that the other three act on to change it from milk to cheese. First, culture is added to the milk. Culture is the bacteria that eats the lactose, the naturally occurring sugars in milk, and converts it to lactic acid. This changes the flavor of the milk and creates an environment that is too acidic for bad spoilage bacteria to tolerate, which is why cheese can be aged for extended periods of time without it going bad. There are six main species of cheese culture and thousands of sub-strains and variations that produce different flavors in the final cheese. Cheese makers use different types of culture to produce different flavors and textures. Next, rennet is added to the milk. Rennet is a naturally-occurring enzyme that was originally discovered in the stomach linings of baby ruminants. It coagulates the milk in order to help the baby animal digest it. Originally rennet was made by putting a piece of stomach from a calf or other ruminant in water and letting it soak—but don’t worry all you vegetarians out there, the rennet that we use is derived from a mushroom that was discovered to produce the same enzyme. Most cheese makers (including Lively Run) now use vegetarian rennet.There are three basic elements in milk: Water, usually around ninety percent of the total volume of the milk. Fats, from three to seven percent of total volume depending on the animal, season, feed, etc. Finally, proteins, again from three to seven percent of the milk depending on the same variables as the fat percentage. Proteins are basically chains of amino acids that, when milk is in its liquid state, are all rolled up into a ball. Rennet works by unravelling those proteins and causing them to bond together. A fourth trace element, calcium, acts as the glue that binds the protein chains together. The fat in the milk is trapped in the grid formed by the stuck-together proteins. The water then separates out and what you are left with is the curd. The curd is then treated in different ways in order to make different styles of cheese. I would go into more detail but that’s another post, or, better yet, come take a tour in the summer and you can come see the process yourself. 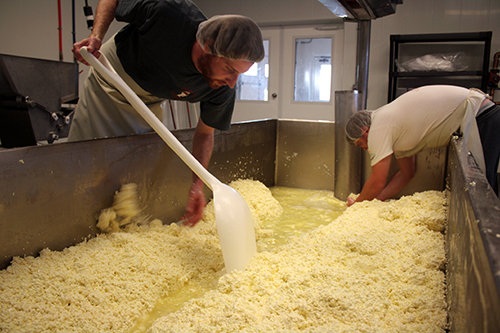 Once the young cheese is made after the first day, salt is added to it in some way. There are many different ways of adding salt, from rubbing it directly on the rind, to floating the cheese in salt water, to adding it directly to the curd. Again, that’s another post. The important part is that the salt, once it’s added, cures the cheese, drying it out a bit more and making it still more impervious to spoilage bacteria. Certain cheeses, like Chevre or Ricotta are made, salted, and then immediately sold. These cheeses are high in water and are best eaten fresh. 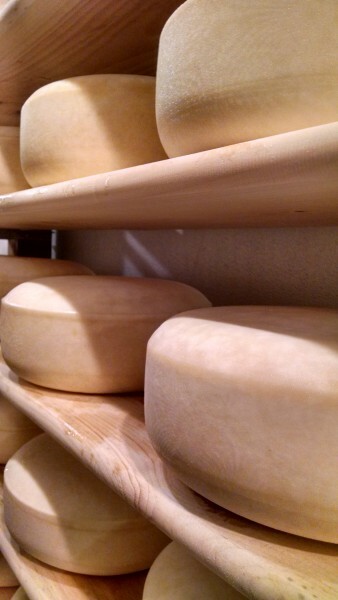 If they age too long, the high water content will contribute to off flavors in the cheese. Some soft cheeses, like Camembert or Brie are aged, but usually no longer than a month. Even those cheeses start to get pretty rank after a month. More on that later. The best cheeses for long aging are hard cheeses that have a very low moisture content. Now, once a hard cheese is made and salted, the aging process begins. There are two processes going on during aging. The first, the development of the culture, is biological, and the second, proteolysis of the proteins, is chemical. As the cheese ages, especially in the early phases, the first two months of aging, the culture that was originally added to the milk is multiplying. As time passes the cultures are growing and eating more and more of the lactose in the milk and changing it to lactic acid. Lactic acid is what gives certain types of cheeses their sharpness or tanginess. Sharp Cheddar is sharp because of the lactic acid. That is why older Cheddar is sharper, because the culture has had more time to eat the lactose and change it to lactic acid. Eventually, all of the lactose in the milk will be eaten and changed into lactic acid. That is why cheese that is eight months or older is safe for lactose intolerant people to eat. After eight months, all of the lactose has been converted to lactic acid. The second process is called proteolysis. This process is a chemical process. As cheese ages the long protein chains that were glued together by the rennet start to break down. Each protein chain is made of links of amino acids and as the cheese ages the chains break into smaller and smaller sections of links. While the lactic acid provides the basic sharpness or tanginess, each amino acid compound is responsible for different flavors and textures in the cheese. The smoky, nutty, meaty, and even bacon-y flavors that you get in long aged cheddars, parmesans, or goudas are impossible without proteolysis. Sometimes you even have tyrosine crystals, that slight crunch that is found in long-aged cheeses. For soft cheeses like Camembert or Brie, proteolysis is what causes that luscious gooey texture, the creamline under the rind that oozes out when you cut into the cheese. However, if proteolysis goes on too long in a soft cheese the cheese will become very soft, completely liquid under the rind, and the high level of moisture will result in a strong ammonia flavor. This can be good up to a point, but eventually the cheese will hit the point of no return. If you think of cheese like a rock song, the lactic acid formation is like the rhythm section, the backbone of the song, providing the groove while the proteolysis is like the singer and the lead guitar, adding embellishments and emphasis to the beat and weaving a melody over top of the rhythm. And just like a band writing a great song, cheese takes time. It needs aging in order to reach its prime, just like a band needs to practice in order to hit the groove right every time. That is why aging is so important. Without aging, a great cheese would never reach its full potential. Hopefully this answers some of the questions that you might have about aging cheese. 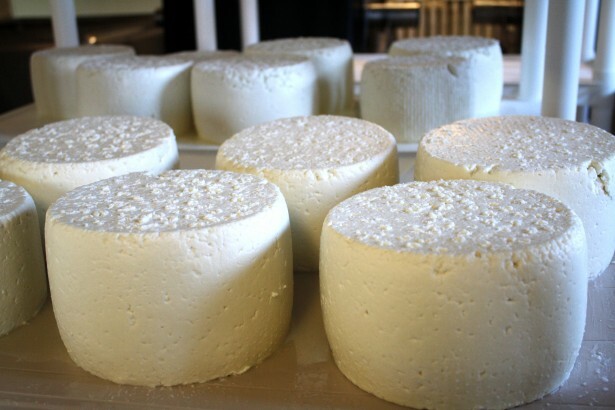 As always, come see our cheese making and aging facilities first hand in the summer and try some of the cheeses that I talk about in my blog posts. And check back. I will be writing more about aging cheeses soon!